Consumer credit scores have been artificially inflated over the last decade ears and are covering up a very real danger lurking behind hundreds of billions of dollars in debt. And when Goldman Sachs is the one ringing the alarm bell, you know the issue may actually be serious. 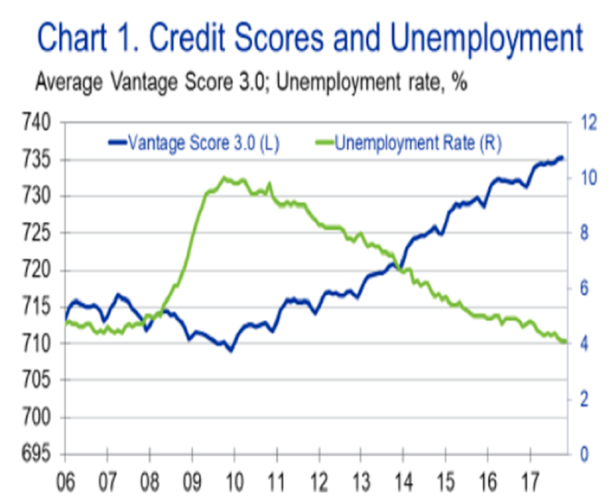 Joined by Moody's Analytics and supported by "research" from the Federal Reserve, the steady rise of credit scores during our last decade of "economic expansion" has led to a dangerous concept called "grade inflation", according to Bloomberg. Grade inflation is the idea that debtors are actually riskier than their scores indicate, due to metrics not accounting for the "robust" economy, which may negatively affect the perception of borrowers' ability to pay back bills on time. This means that when a recession finally happens, there could be a larger than expected fallout for both lenders and investors. There are around 15 million more consumers with credit scores above 740 today than there were in 2006, and about 15 million fewer consumers with scores below 660, according to Moody’s. On the surface, this disappearance of subprime borrowers is good news. But is there more than meets the eye to the American consumer's FICO score renaissance? The problem is most acute for smaller firms that tend to lend more to people with poor credit histories. Many of these firms rely on FICO scores and are unable to account for other metrics, like debt-to-income levels and macroeconomic data. Among the most exposed outstanding debts are car loans, consumer retail credit and personal loans that are doled out online. These types of debt total about $400 billion - and about $100 billion of that sum has been bundled into securities that have been sold to ravenous yield chasers "investors". Meanwhile, cracks are already starting to show on the surface: there has been a rising number of missed payments by borrowers with the highest risk, despite the past decade of "growth". And now that the economy is starting to show weakness, these delinquencies could accelerate and lead to larger than expected losses. Goldman Sachs analyst Marty Young said in an interview: "Every credit model that just relies on credit score now - and there’s a lot of them - is possibly understating the risk. There are a whole bunch of other variables, including the business cycle, that need to be taken into account." FICO credit scores are used by more than 90% of U.S. lenders to determine whether a borrower is an acceptable risk. Most scores range from 300 to 850, with a higher score purporting to show that someone is more likely to pay back their debts. Some big banks and lenders have recognized the problem and have included other factors in their underwriting decisions. "Borrowers’ scores may have migrated up, but inherently their individual risk, and their attitude towards credit and ability to pay their bills, has stayed the same. You might have thought 700 was a good score, but now it’s just average," deRitis continued. 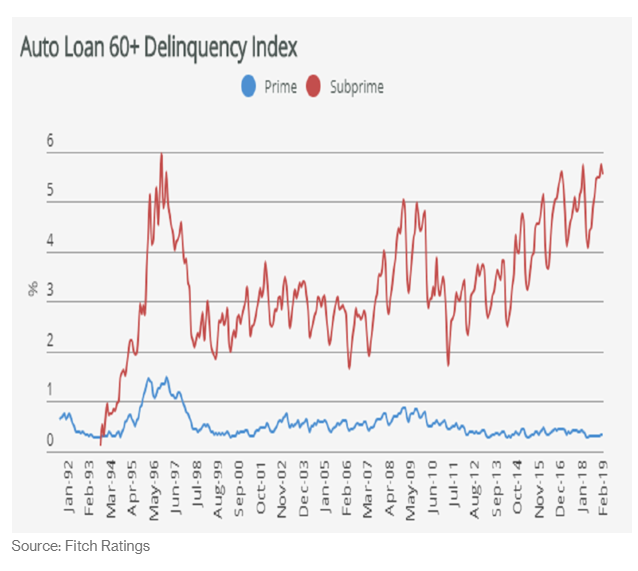 Goldman's Young attributes the rise in missed auto loan payments to the change in scores. The Federal Reserve Bank of New York said the number of auto loans at least 90 days late topped 7 million at the end of last year. Marketplace and peer to peer lending has also been showing signs of stress. Missed payments and writedowns increased last year, according to NY data and analytic firm PeerIQ. "We don’t see the purported improvement in underwriting just yet," PeerIQ wrote in a recent report. And the pressure isn't just showing up in auto loans and marketplace lending. Private label credit cards, those issued by stores, instead of big banks, saw the highest number of missed payments in seven years last year. “As an investor it’s incumbent on you to do that deep credit work, which means you have to know as much as possible about how things should pay off or default. If you don’t think you’re being paid for the risk, you have no business investing in it,” Russell-Dowe concluded, stating what should be - but isn't - the obvious.